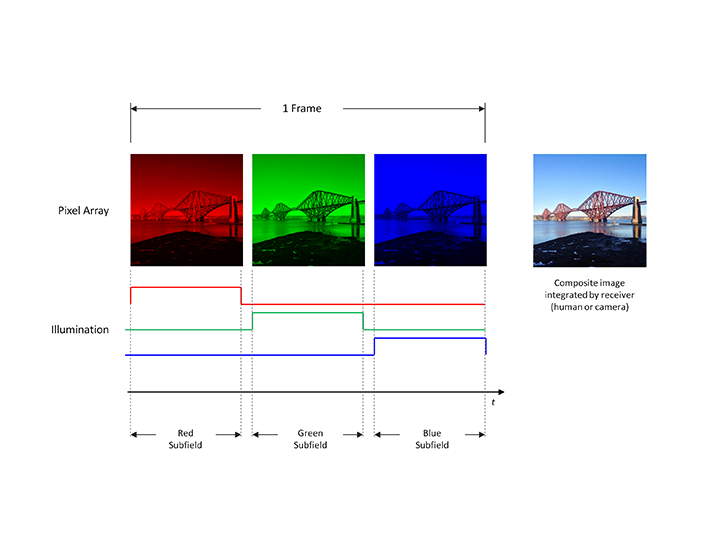 Time Domain Imaging (TDI™) colour creation is based on the fact that any full colour image can be divided into three primary colour components; red, green and blue. Using appropriate illumination, the microdisplay renders these colour components sequentially over time. This process happens so fast that the Human Visual System (HVS) integrates these colour components into a single, full colour image. In the Forth Dimension Displays microdisplay system, each frame is divided into three sub-frames as shown. In the red sub-frame, only the pixels required to generate the red component of the image are switched on. At the same time, the microdisplay is illuminated with a red light source. This is repeated for the green and blue components. This technique of colour creation allows Forth Dimension Displays’ microdisplays to use the same pixel mirror for all three colour components. This compares favourably with other microdisplay technologies (where each colour component is assigned its own sub-pixel) as it enables high picture fidelity.